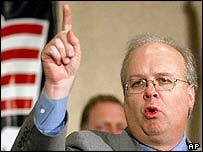 Political visionary or ruthless tactician - whatever the description, Karl Rove's influence on US politics has been beyond doubt. He was at the heart of some of the biggest decisions made by the Bush administration - and some of the biggest controversies. Mr Rove was the chief strategist in George W Bush's two presidential election victories, a role that made him highly regarded by Republicans and reviled by Democrats. Early in President Bush's second term, Mr Rove was promoted to deputy chief of staff in charge of most White House policy co-ordination, including matters ranging from homeland security and domestic policy to the economy and national security. 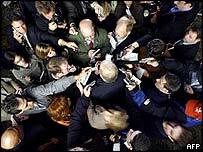 Just over a year later in April 2006, he was relieved of this responsibility to concentrate on electoral politics - fundraising and big-picture thinking ahead of the November mid-term congressional elections. The White House was grappling with mounting problems and falling approval ratings for the president, partly due to growing dissatisfaction over the handling of the Iraq war. Mr Rove's task was to stop the Republicans losing control of either or both houses of congress in November. Despite his previous electoral successes, he failed. The latter part of his time in the Bush administration was also overshadowed by investigations into the leaking of an undercover CIA agent's identity - a criminal offence. Mr Rove himself was not prosecuted over the leak but another official, Lewis "Scooter" Libby, was found guilty of perjury and obstructing justice in connection with the case. Mr Rove has also been at the centre of another political row that has pitted Congress against the White House. The dispute began after Attorney General Alberto Gonzales fired eight federal prosecutors in 2006 - an unusual but not illegal move. Democrats said the sackings were politically motivated and that Mr Rove knew of the discussions about the firing of the attorneys nearly two years before they were sacked. 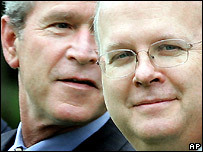 Mr Bush used his executive privilege as president to order Mr Rove not to testify at hearings on Capitol Hill. There are some who considered everything Mr Rove did as Machiavellian machination. Mr Rove was accused of using underhand tactics against Democrats ever since his teenage years. As a student, he invited Chicago vagrants to turn up for free beer at a plush reception for a Democrat state candidate - an incident he later described as a "youthful prank" that he regretted. Later, in 1970, he won control of the College Republicans, and was embroiled in further allegations of dirty tricks. He found himself being investigated by Texas congressman and future President George Bush Sr, who exonerated him and then hired him. Since then, Mr Rove has been closely linked to the Bush family's fortunes, eventually helping propel George W Bush into the White House. He micro-managed his campaigns, but also governed the strategy. He defied convention in the 2004 election campaign by aiming not at the middle ground but at Mr Bush's base, the religious right. The approach worked, delivering a clear victory in the popular vote for Mr Bush. The younger Bush is said to have endowed Mr Rove with the nickname "Turd Blossom", after the beautiful wild flowers that sprout from cowpats in Texas. It appears the president appreciated his adviser's ability to bring him out of the stinkiest situation smelling of roses. Mr Rove, born in 1950, survived some tough years. His father walked out of the family home on Christmas Day 1969 - his 19th birthday. Then he found out this man was not, in fact, his father. His mother committed suicide 12 years later. From inauspicious beginnings, Mr Rove rose to one of the most powerful positions in US politics and became the man some considered to be the power behind the throne. His supporters say that for the "genius" of his political direction, he fully deserved to be there. Mr Rove has been married twice and has a son.